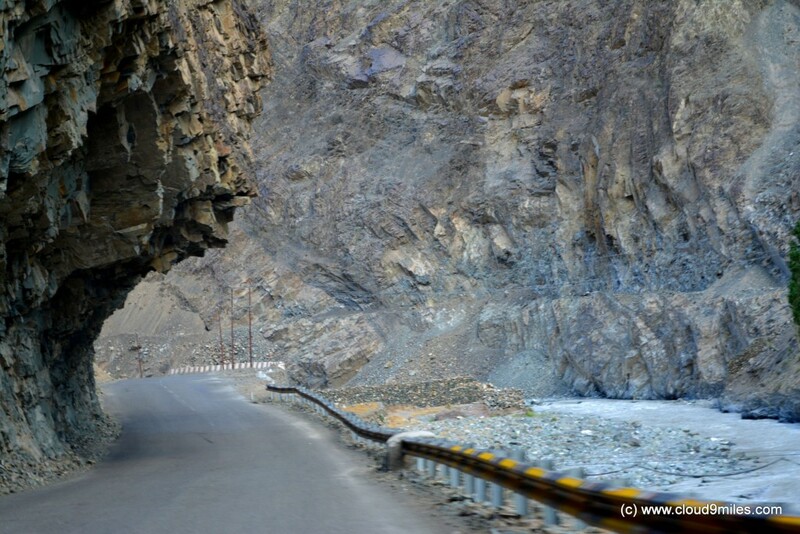 The treacherous stretch of the Srinagar – Leh Highway i.e. 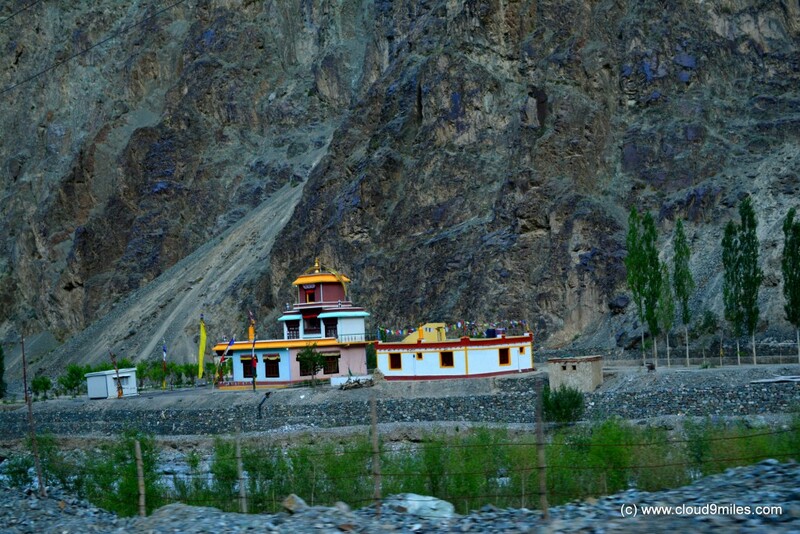 Zoji La (Day 3: Sonamarg to Kargil) gave a sense of satisfaction and confidence for our onward sojourn. We enjoyed every aspect of our journey i.e. 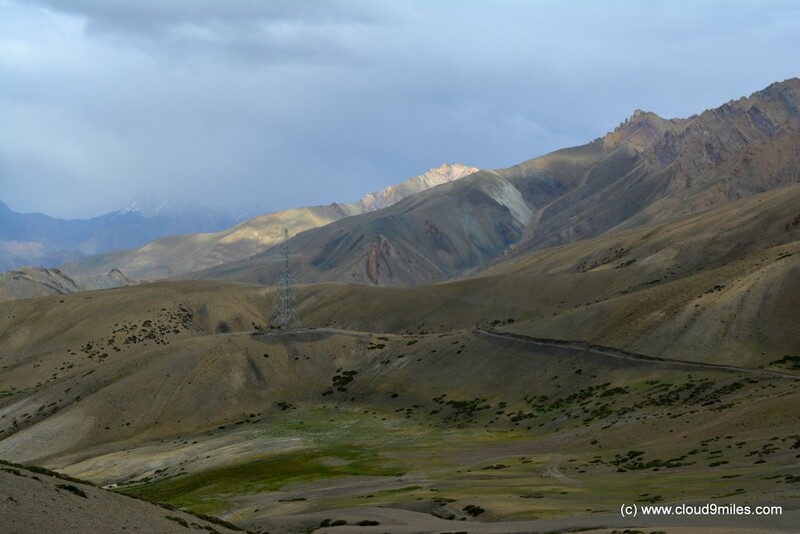 panoramic landscapes, tough terrains, thrilling drive, and glacier. 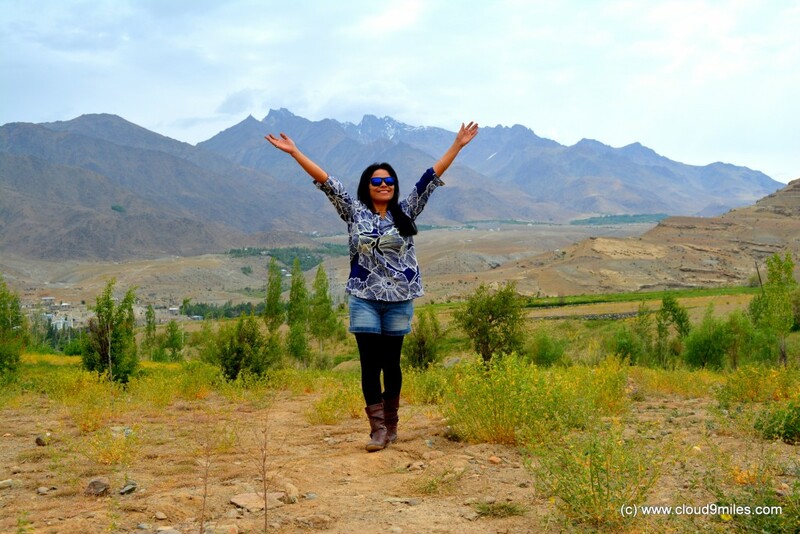 Our target for this day was to again relish the bounty of nature and cover the distance till Leh. 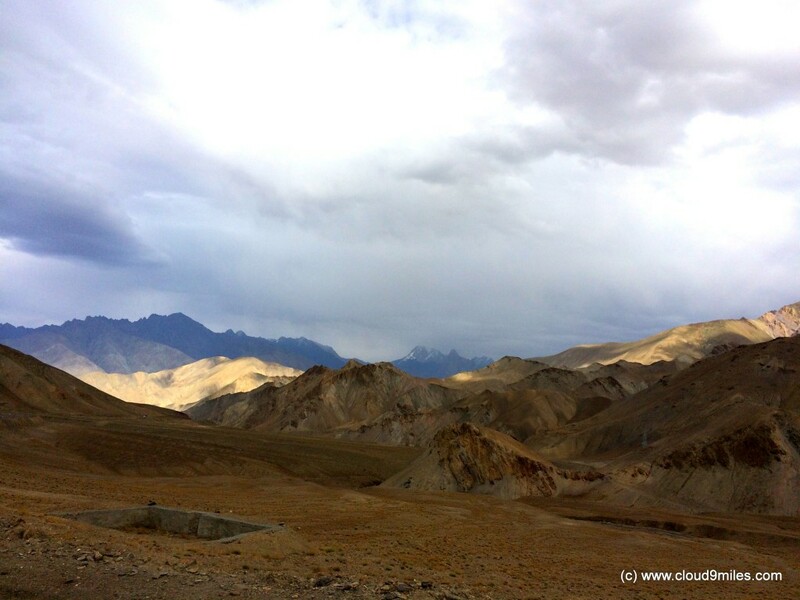 We were eagerly waiting for the mysteries of Ladakh that was getting unfolded at every juncture of our journey. 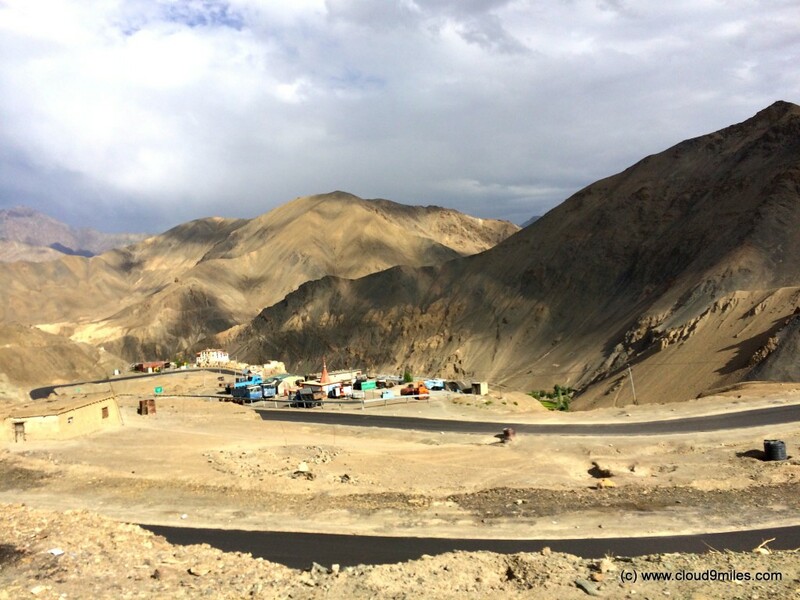 The gradual change in topography was overwhelming that has kept us engaged all throughout our progress towards Leh. 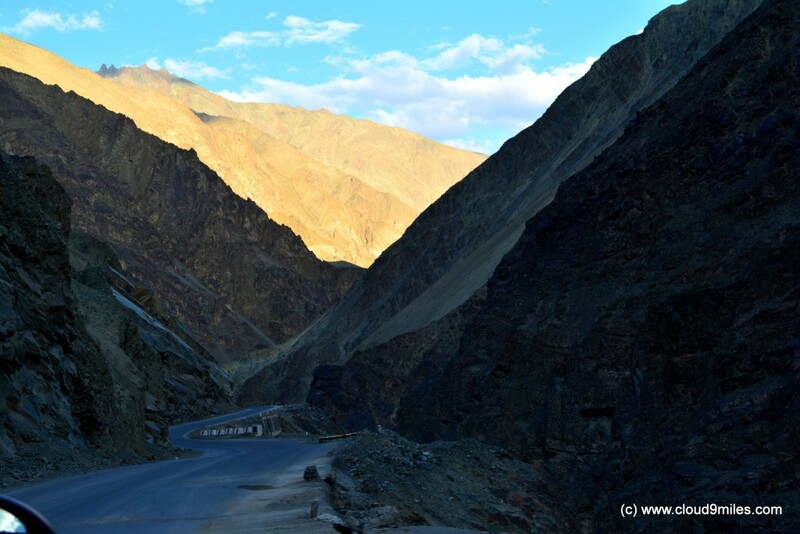 We would also be covering two high mountain passes on the Srinagar – Leh highway i.e. Namika La & Fotu La. The route set for the journey was straight forward. At the hotel we were informed about LOC view point and some of us decided to take this detour first thing in the morning before proceeding towards Leh. The Line of Control (i.e. 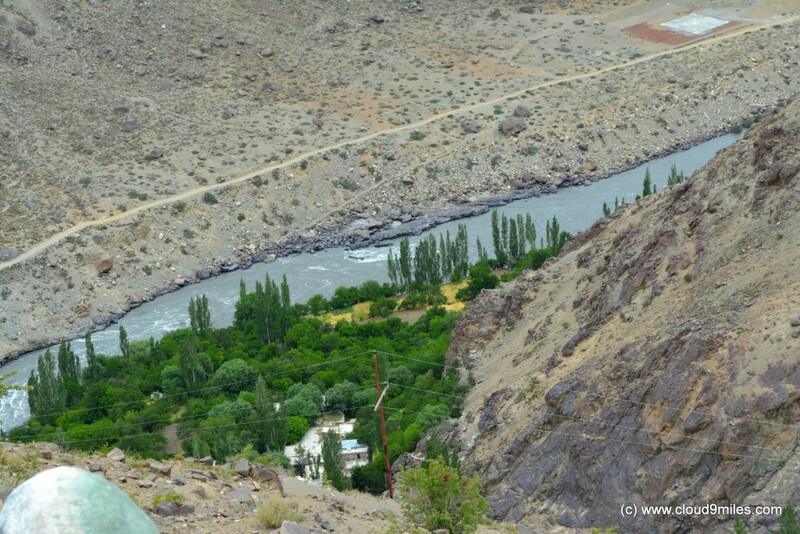 the de facto border between India and Pakistan) is very near to the north of Kargil and one can see from distant village on the other side of LOC. After breakfast we started our journey towards the LOC view point at around 9 am in the morning. 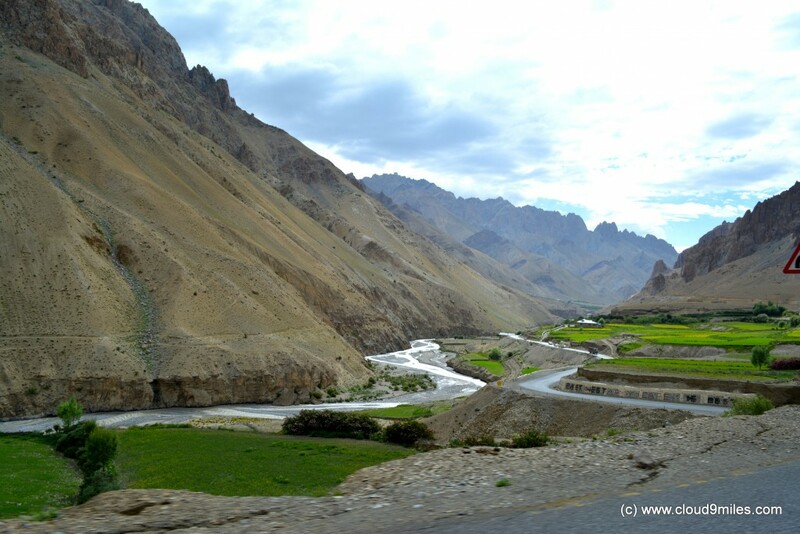 We moved through a narrow road with twist and turns with river Suru far below the terrain. 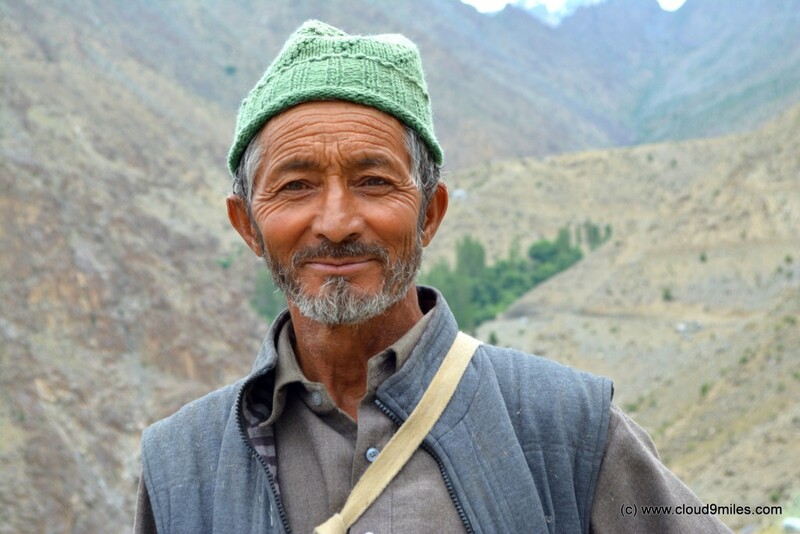 We noticed green cover at the base of the mountain on the bank of Suru River. 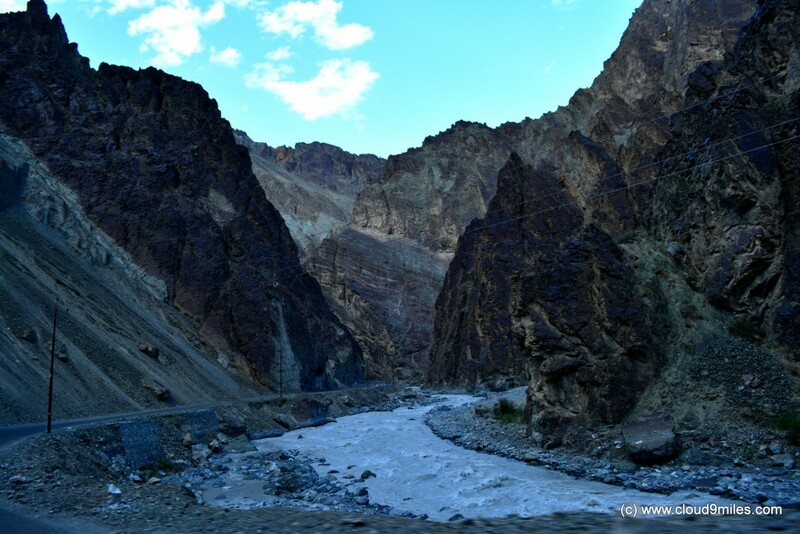 The narrow road had less or almost no traffic movement and has stiff inclination with no barrier on the river side. We finally reached the place where we could see army base but no sign board stating it as a view point. 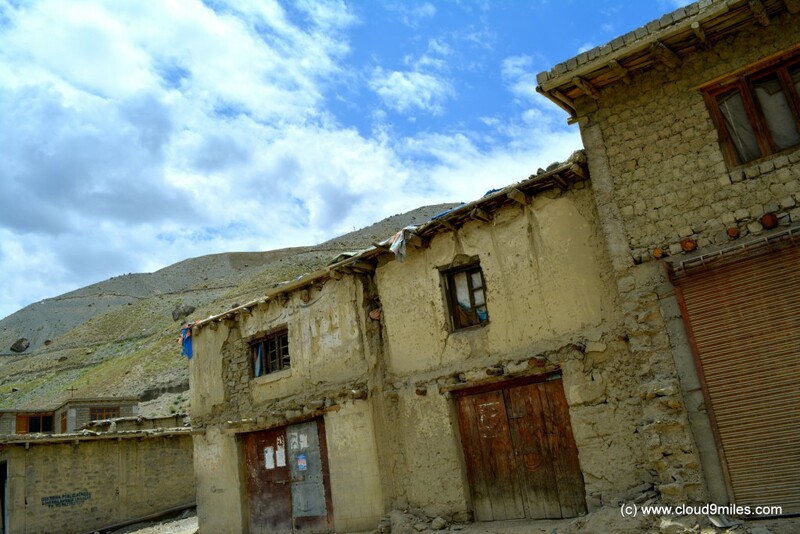 We passed through villages and could see some on the mountains as well. We saw the territory on the other side of the border as well. 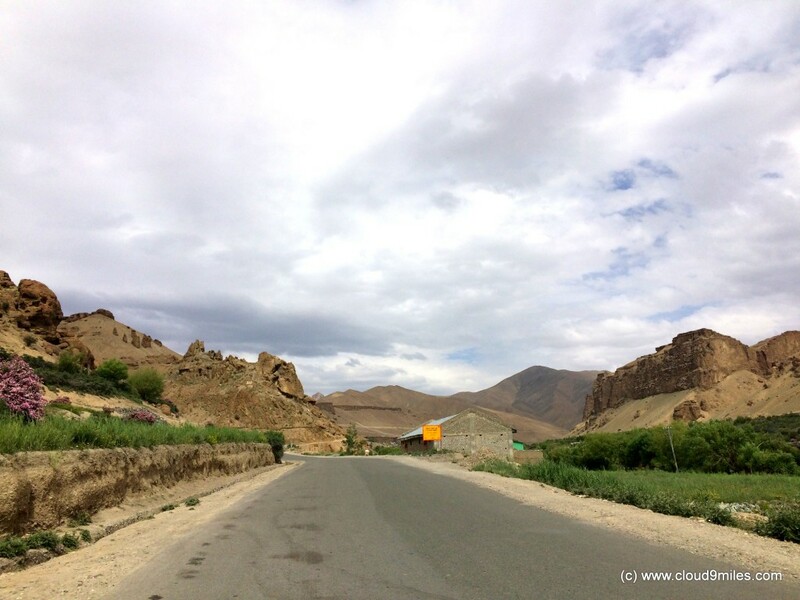 After spending some time we headed back towards Kargil for our onward journey towards Leh. 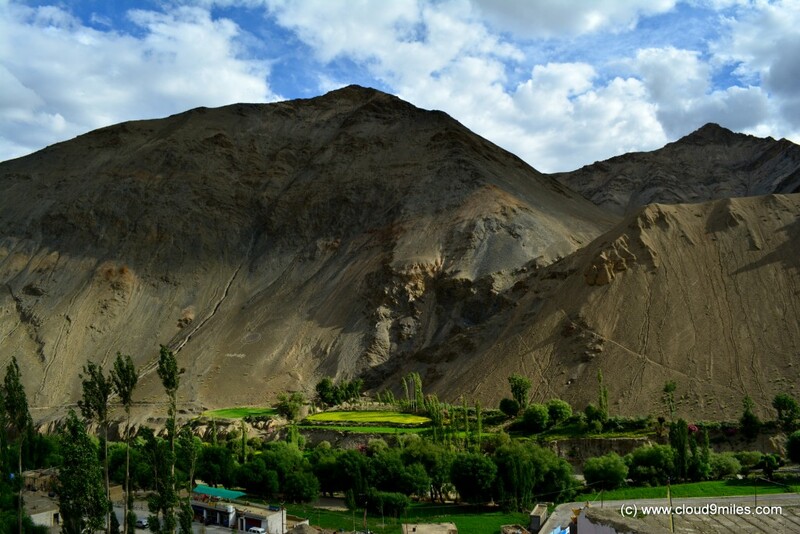 A green patch at the base near Suru River! 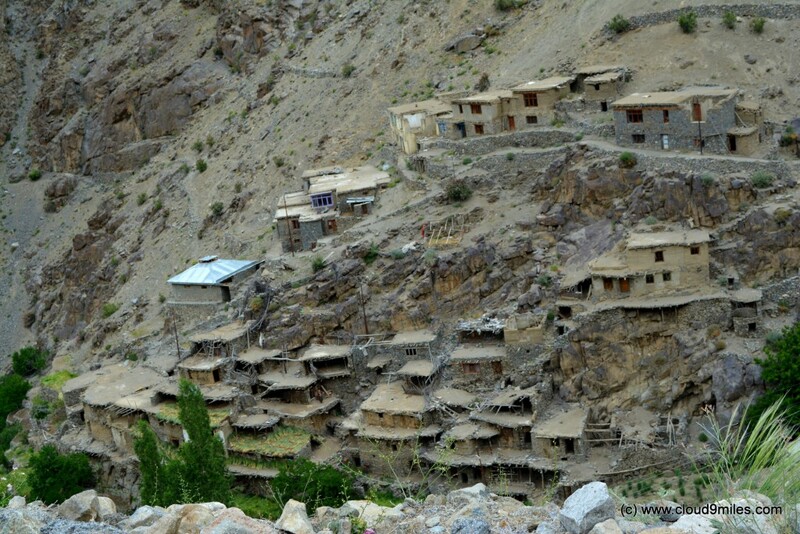 A village near LOC in Indian Territory! 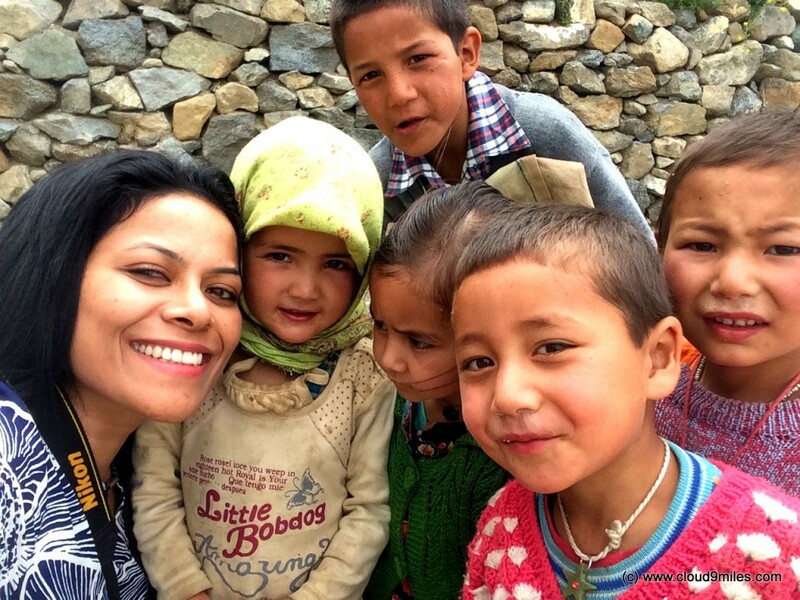 Selfie time with village kids! 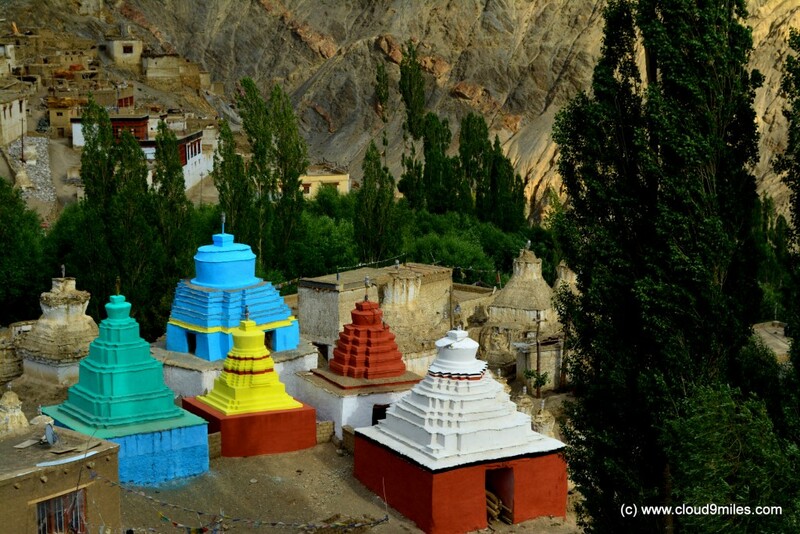 After Kargil is the arrival of Buddhist territory of Ladakh with its flavour of bliss. 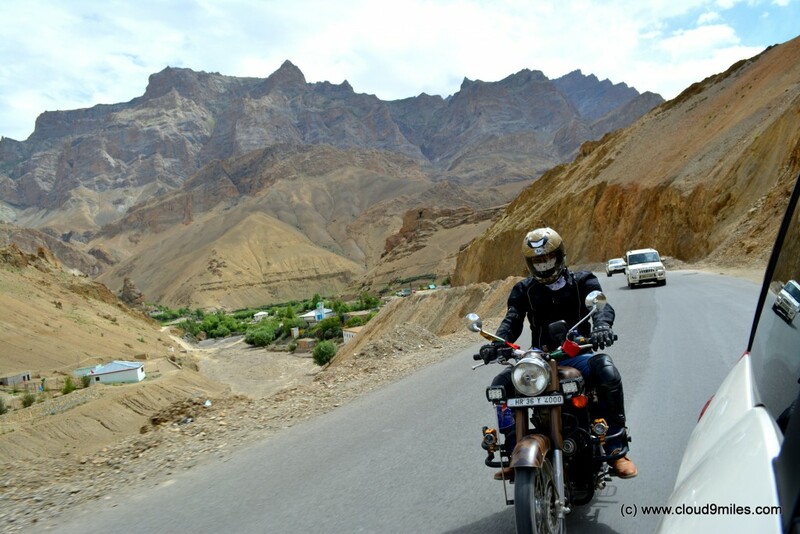 By the time we left Kargil towards the mystical land of Ladakh it was 11:35 am and the trip meter was at 2558 KM with an arduous task of covering the distance till Leh. After driving ten minutes only we came across rough roads but thankfully this stretch was only 10 KMs long which took only twenty minutes to cover. 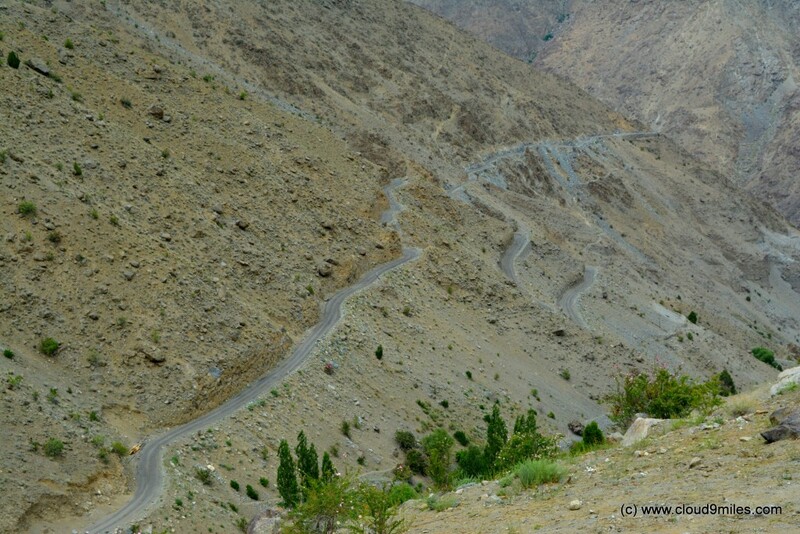 The road ahead was seamless and it was a delight to drive on such a terrain at high altitude with all round panoramic view. We came across a natural spring on the highway where we took a snacks break and washed our car under the spring. Somehow we lost a significant amount of time on this break i.e. almost 2 hours but by looking at the road conditions we were confident of achieving our target. Driving with this view is a dream come true! 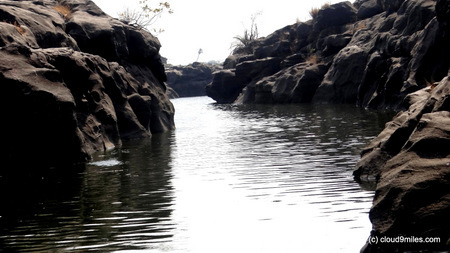 Rocky terrain on the way! 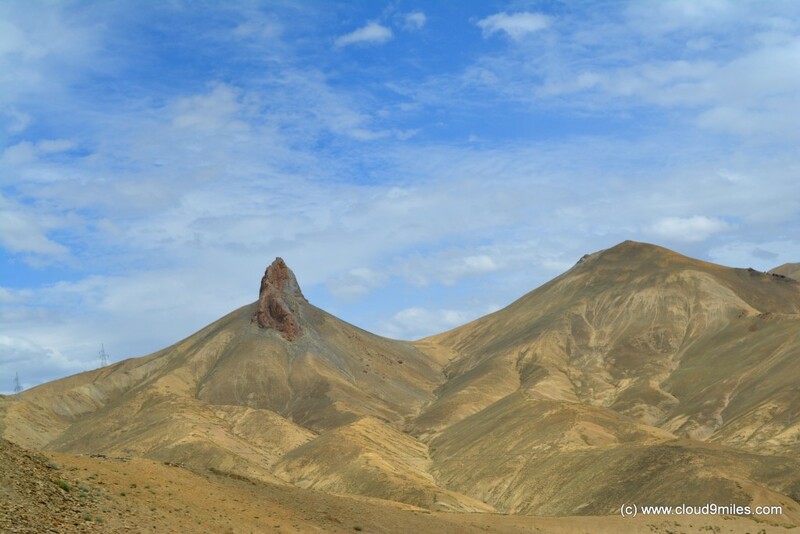 We reached Mulbekh (alt 3304 mtrs) @ 2:35 p.m. thereby covering a distance of 31 KMs. 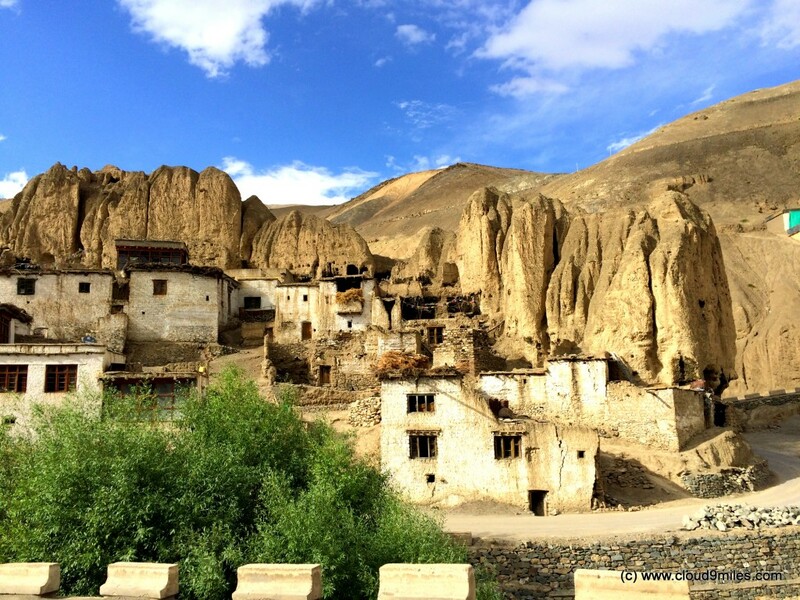 Mulbekh is a town which one could easily pass through without even noticing it but is known for Mulbekh monastery situated on the side of NH-1D. 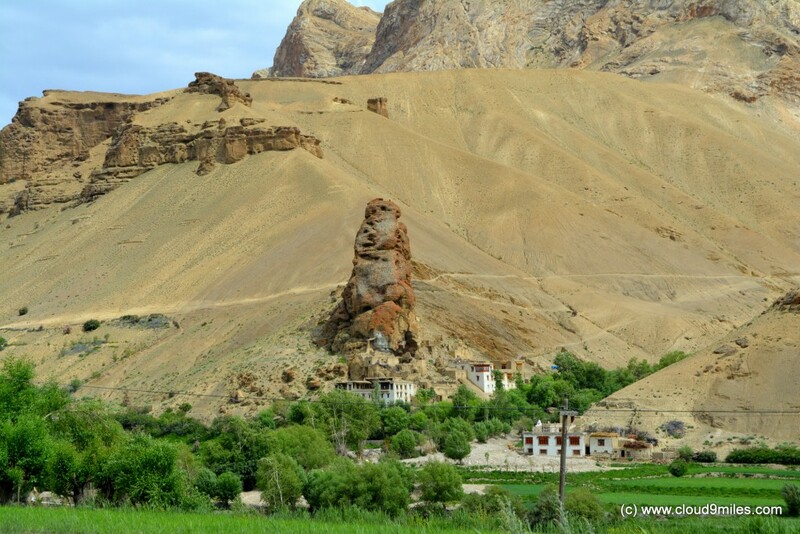 Next to the road is a statue of Maitreya, future Buddha carved on a single rock face which overlooks the highway. 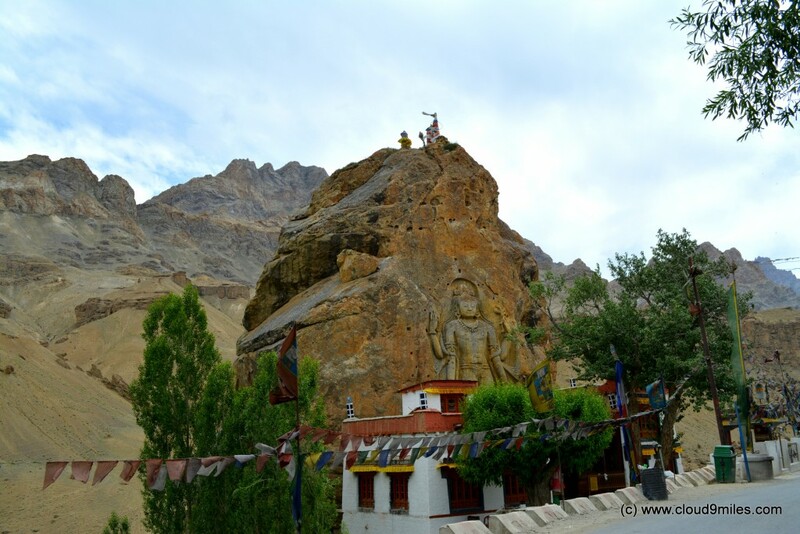 It is believed that the 9 meter high statue was built in 7th or 8th century. A closer view of the rock and adjacent village! Maitreya – The future Buddha! 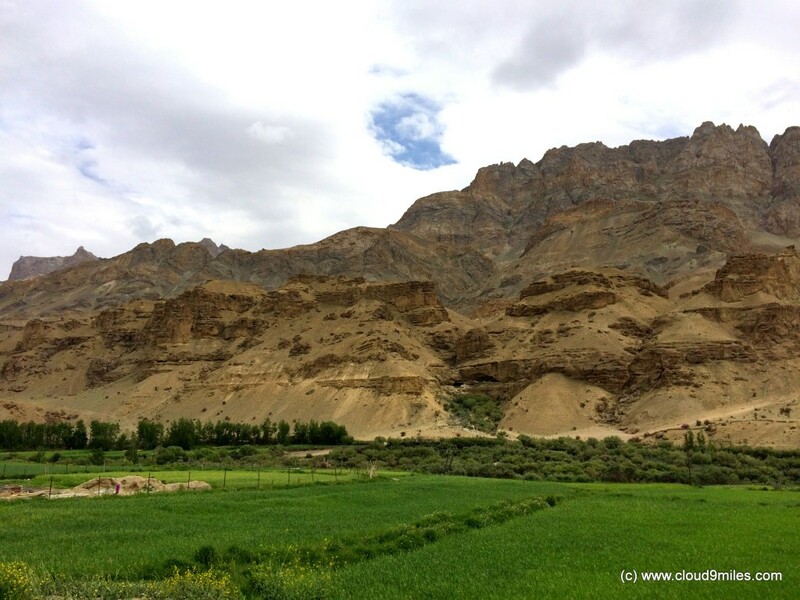 A hint of colour on the barren land! 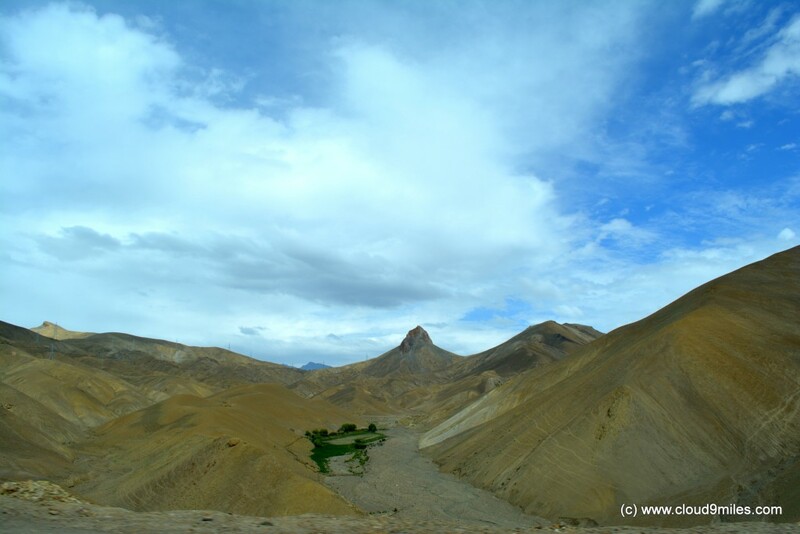 We arrived at Namika La (alt 3700 mtrs) @ 3:10 p.m. thereby covering 45 KMs. 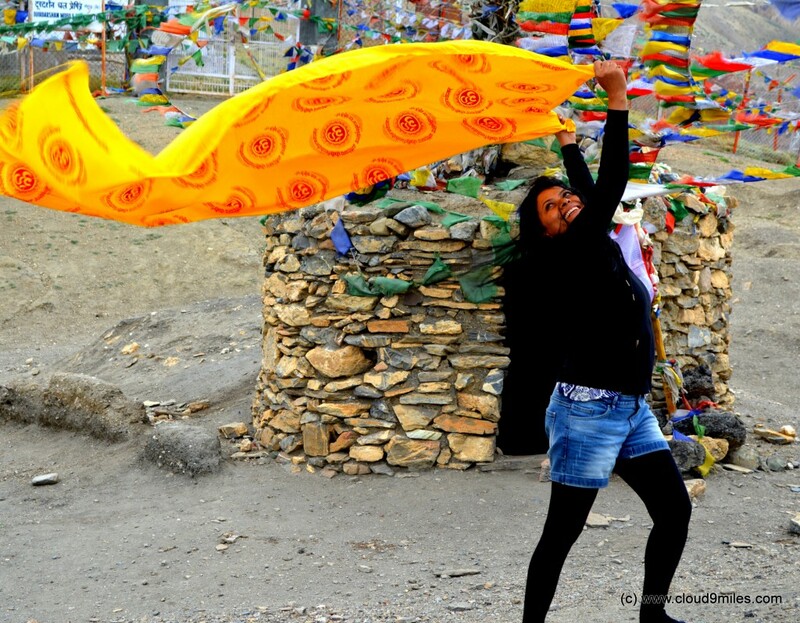 The pass was beautifully decorated by prayer flags which were fluttering in strong wind. 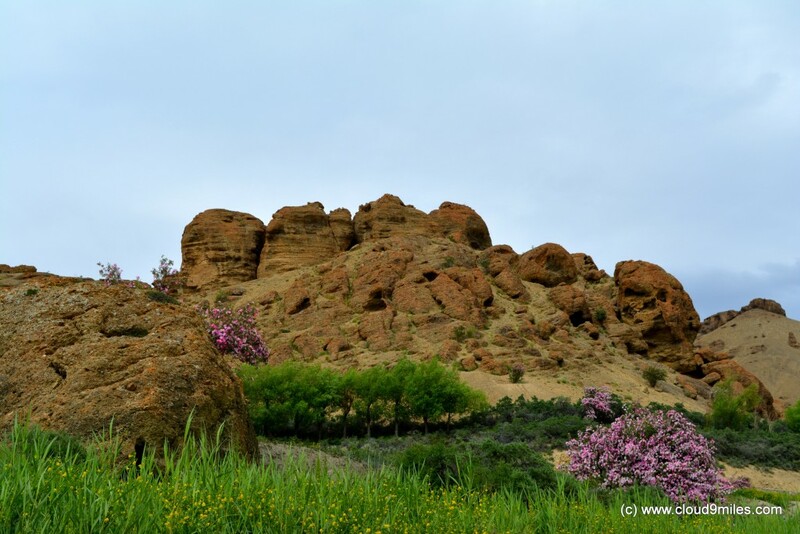 The terrain all around this place was mostly barren but still beautiful. 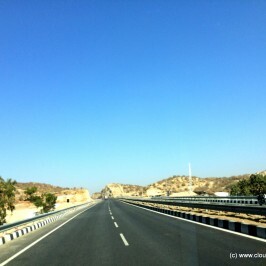 After a small stop over we moved ahead with our onward journey on this beautiful highway. 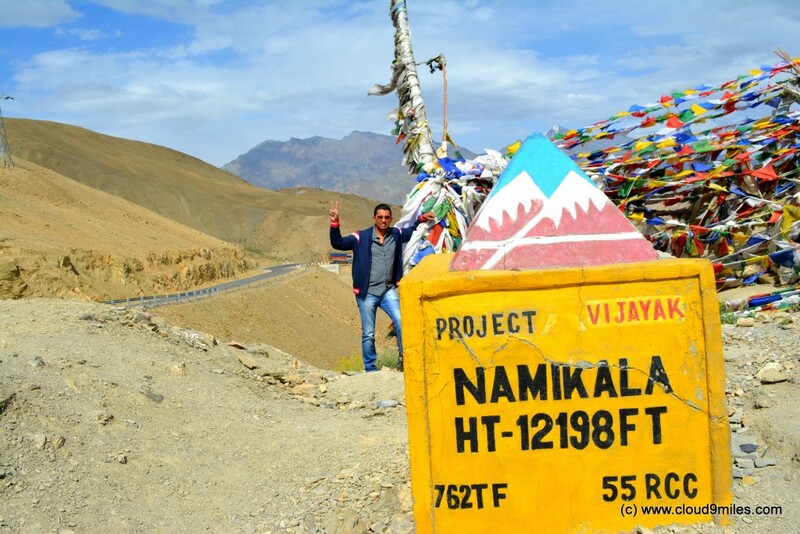 Namika – pillar of strength! Shree at Namika La with fluttering player flags! Highway as seen from Namika La! Highway on the other side of Namika La! 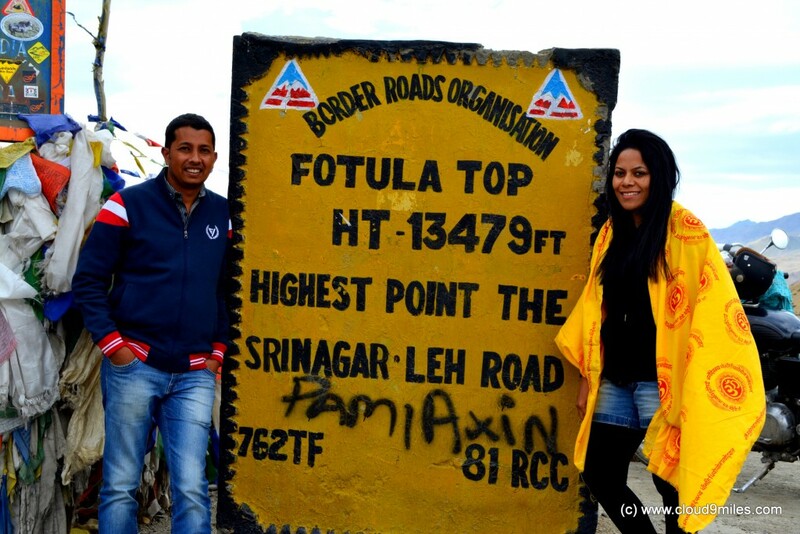 We reached Fotu La – the highest point on NH-1D (alt 4108 mtrs) @ 4:15 p.m. thereby covering a distance of 82 KMs. Once again a similar topography like Namika La with very high velocity of wind. 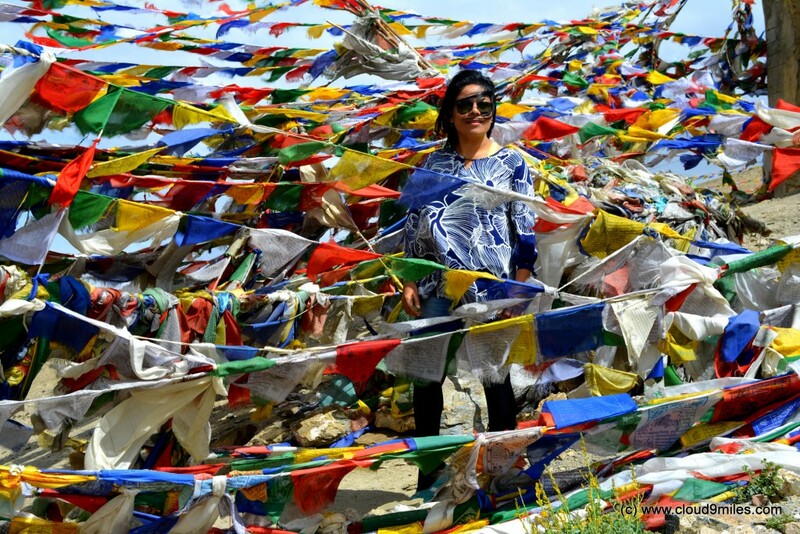 Again the pass was beautifully decorated with prayer flags. 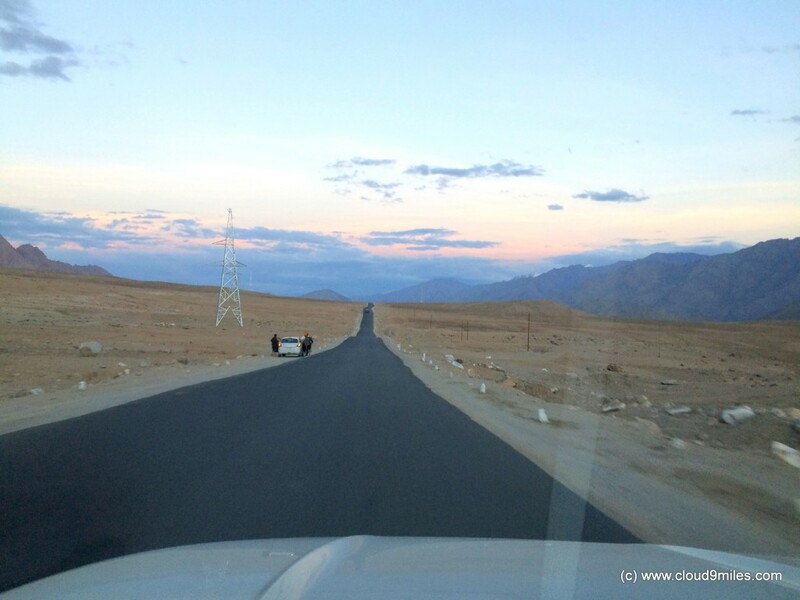 We started our descent from Fotu La through winding roads and beautiful landscapes. 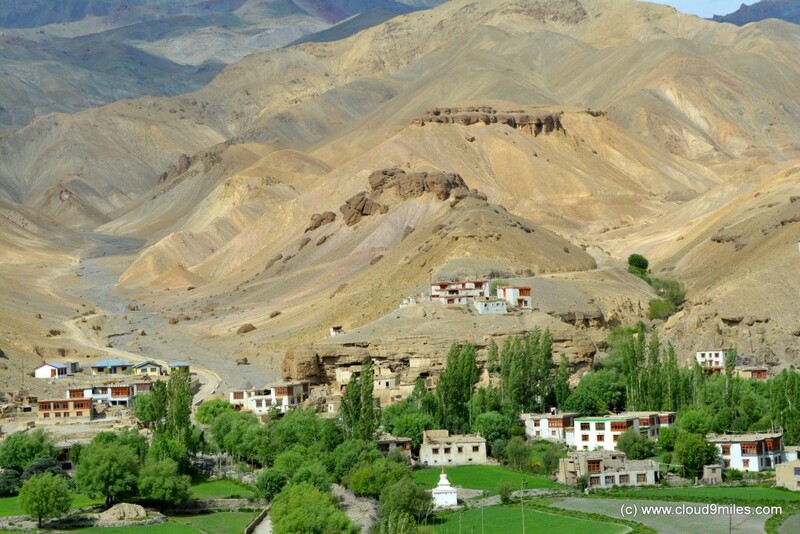 From a distant we could see the Lamayuru Monastery on a hill and were mesmerized by its beauty. 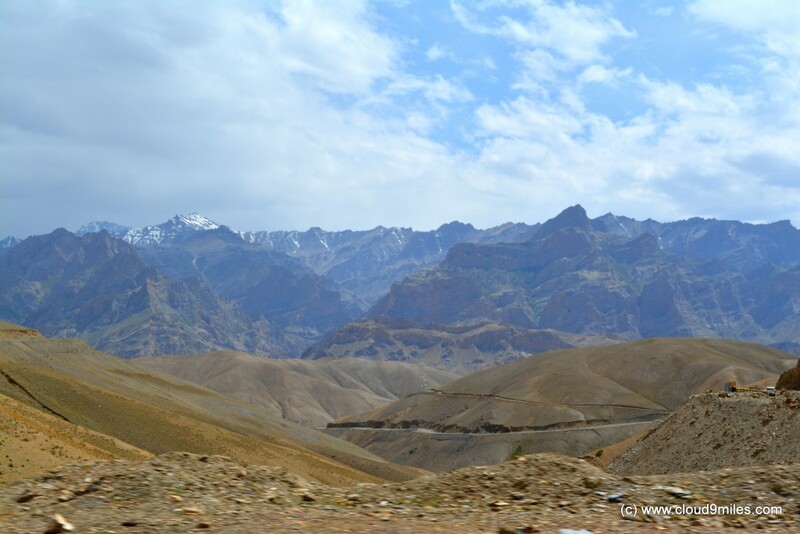 Drive through beautiful terrain towards Fotu La! 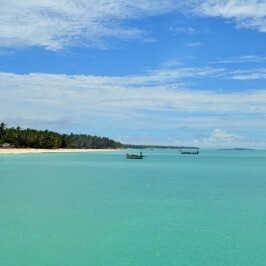 On the way to Fotu La! View of the terrain from Fotu La! 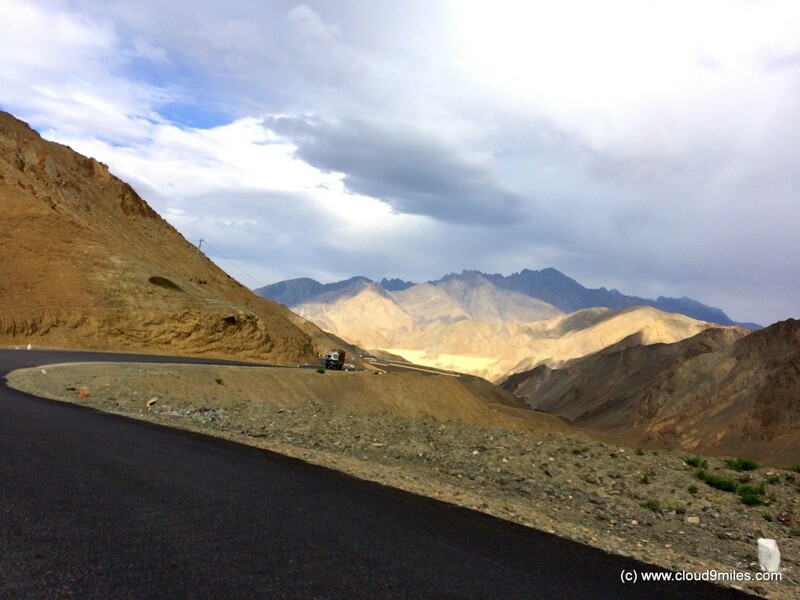 Another one in our kitty – the highest point on Srinagar – Leh Highway! 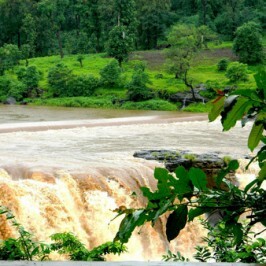 Shree played with high velocity of wind! We arrived at Lamayuru (alt 3510 mtrs) @ 5 p.m. thereby covering 98 KMs. 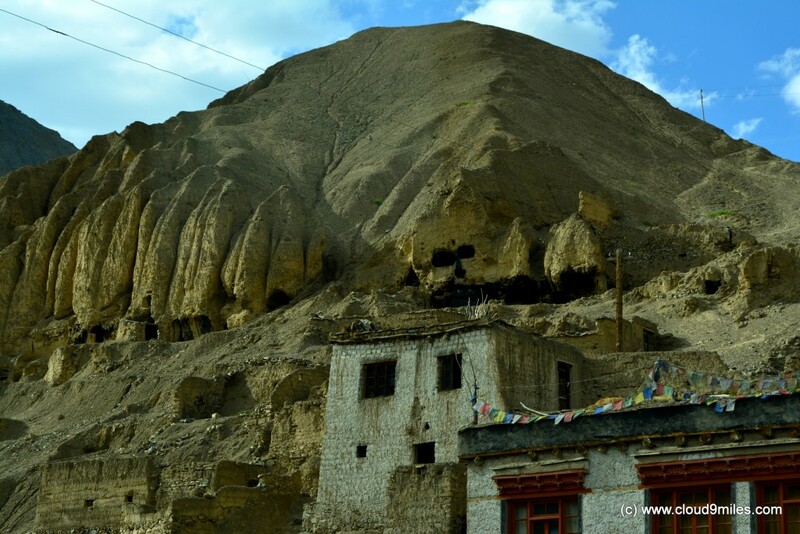 This was built in 10 th century and considered to be one of the main gompas of Ladakh. The faces carved on the mountain, prayer wheels, lamps, and colourful flags all over were sending a spiritual message to us. This region has altogether a different topography. We took a halt of one hour for lunch and tried local dishes like thukpa, chowmein, noodles, soup, fried rice for our menu. 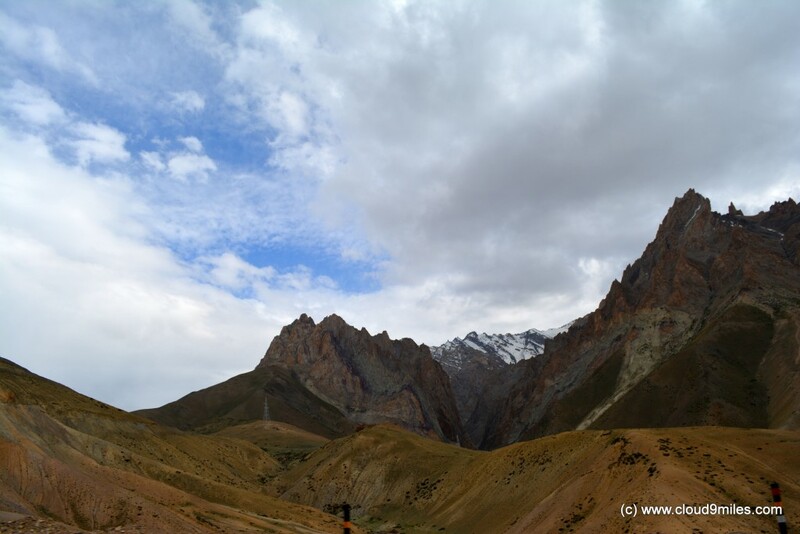 Few kilometres down the line we were welcomed by a dreamy land which is known as Moonland. 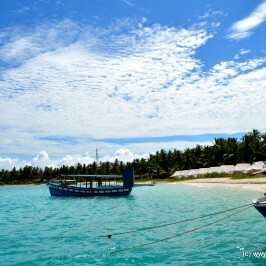 The landscape was stunningly beautiful and has been rightly named as Moonland. 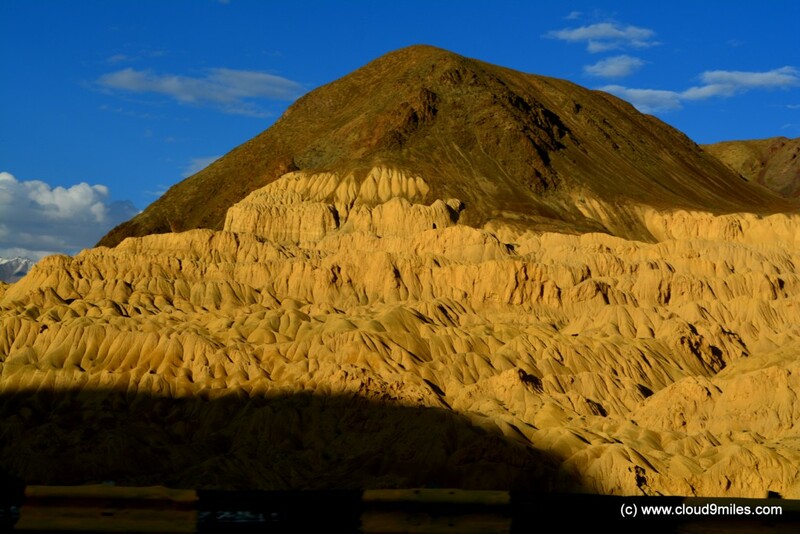 The moonlike landscape was amazingly different from adjacent mountains and the soil was glowing considerably on sunlight. One can easily imagine the origin of moonlight through the glowing Moonland. 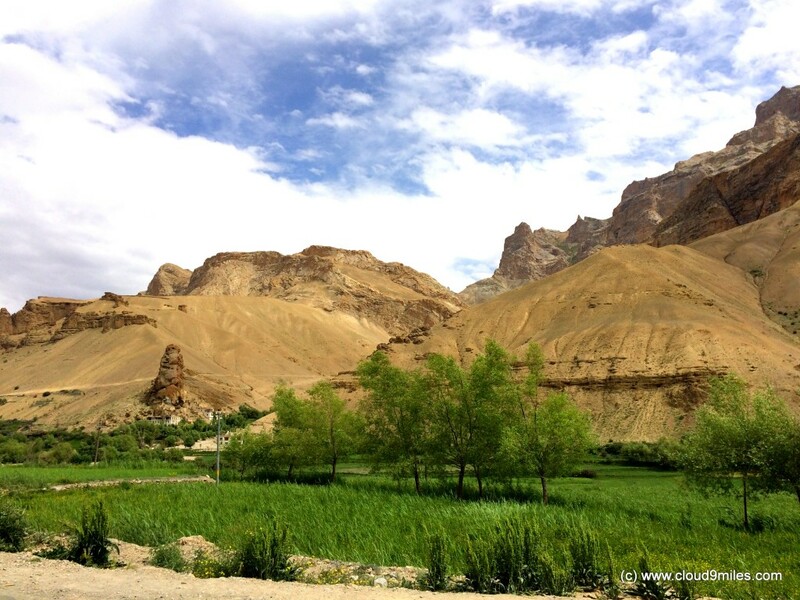 We were also amazed with the sight of green terrain at the bottom of the hills on this pre-dominantly barren land. Descent from Fotu La towards Lamayuru! Lamayuru on top of a hill seen from a distant! Carved faces on the mountain! We continued our journey and crossed Uleytokpo @ 7:20 p.m. and Likir @ 7:40 p.m. thereby covering 132 and 150 KMs respectively. 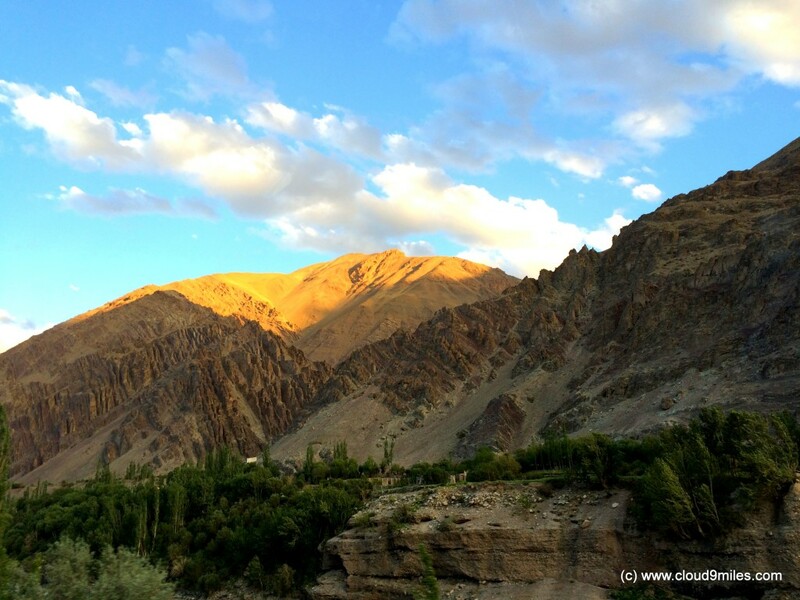 In a bid to reach magnetic hill before dusk we drove at a handsome speed but could not won the race against time and reached there at 8:15 p.m. We were just 15 minutes late but nonetheless we enjoyed the drive through beautiful landscapes. At one point we could see the long stretch of highway on a table top mountain and it was amazing. 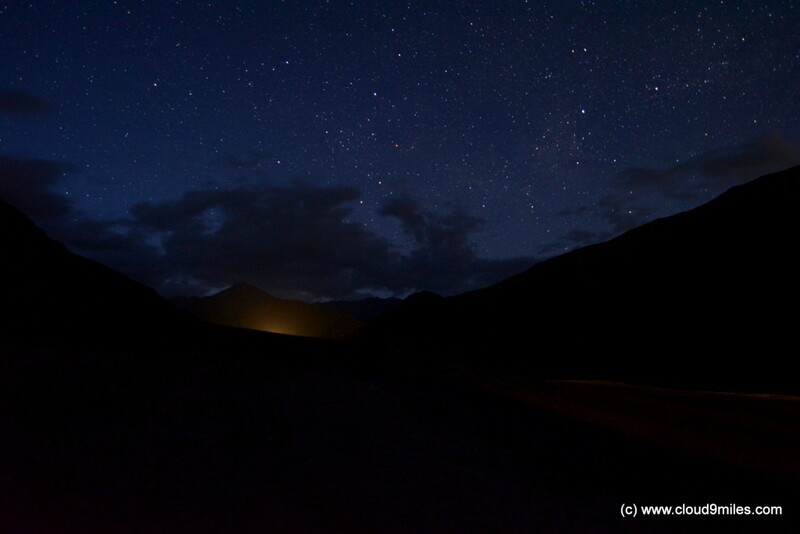 We took a break at magnetic hill and the sight of infinite glittering stars made our journey precious. 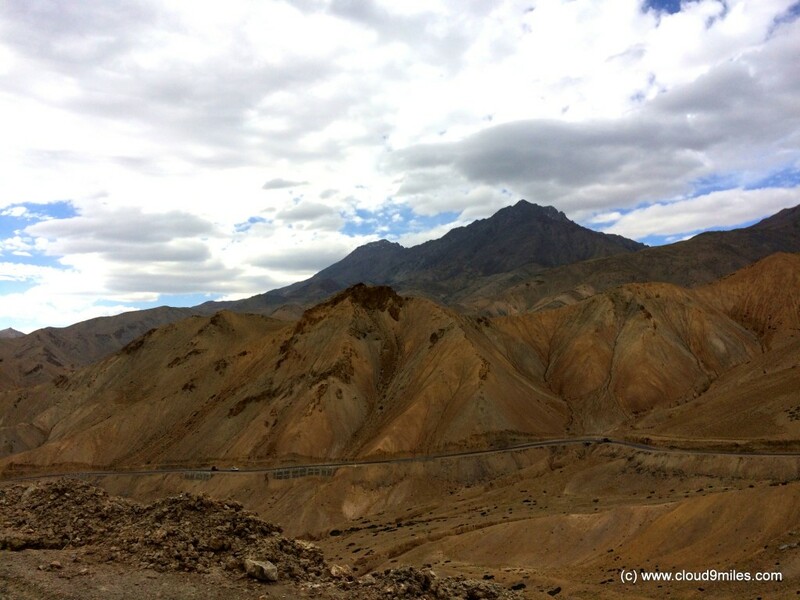 Just before reaching Leh came a sight that took our breath away. We saw moon rising from the horizon where we were above the horizon. A sight that will remain embedded in our memory till eternity. 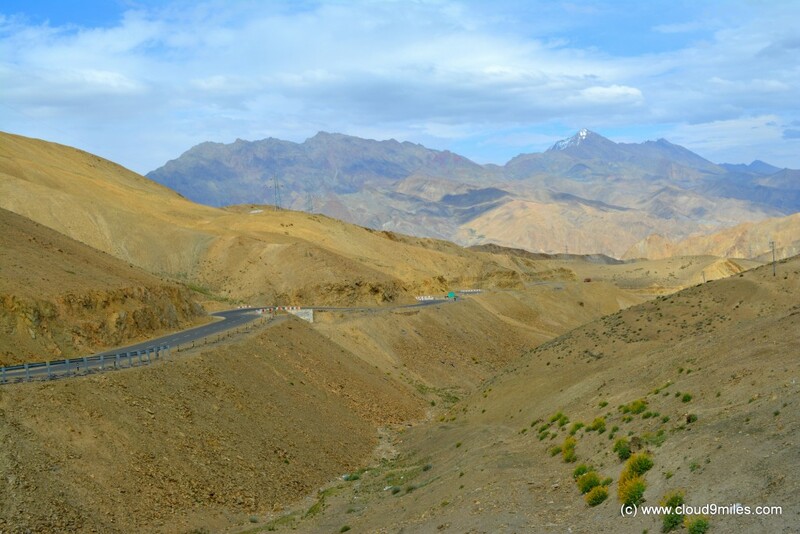 Finally we reached Leh @ 10 p.m. thereby covering a distance of 212 KMs. 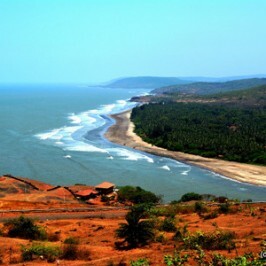 Overall we covered 2770 KMs from Mumbai. 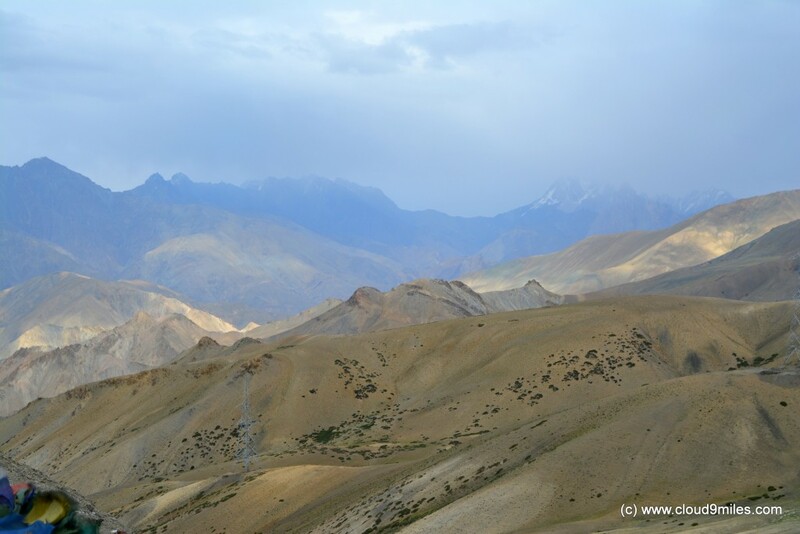 We, though, were travelling on high lands but mostly it looked like moving on a plain terrain barring two high passes. Highway leading the way to horizon! 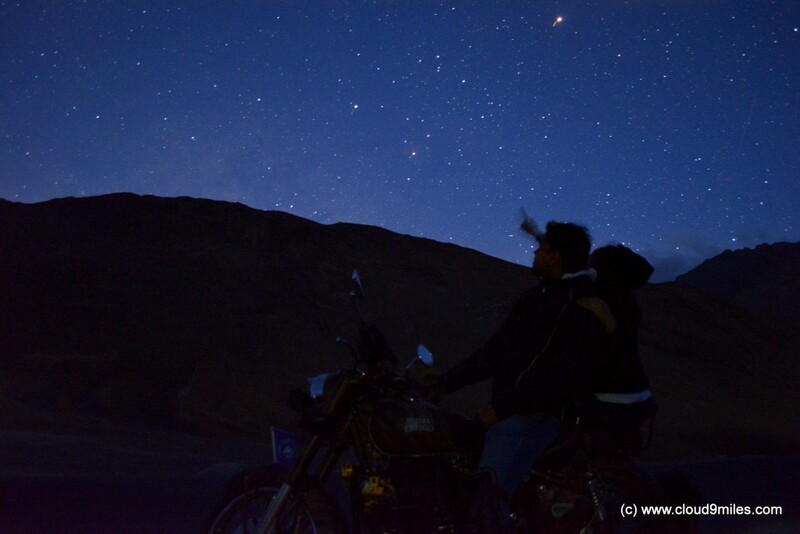 Gazing the stars at Magnetic Hill! 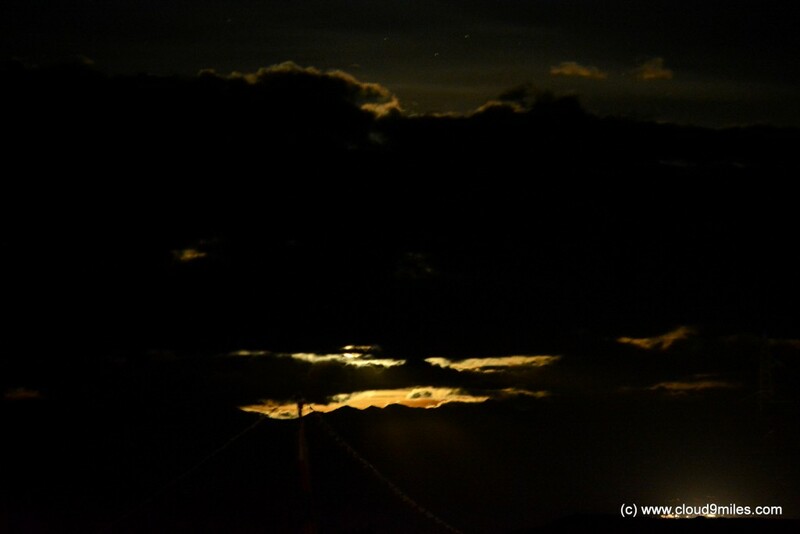 Moon rise just after it came above horizon which took our breath away! 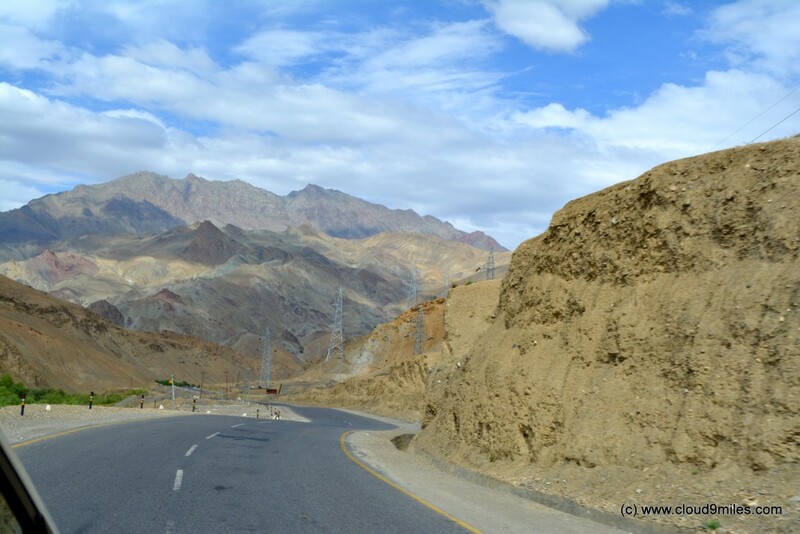 The highway actually is a gateway to heaven with changing topography and landscape at every juncture. At some places it felt like we were about to meet horizon. 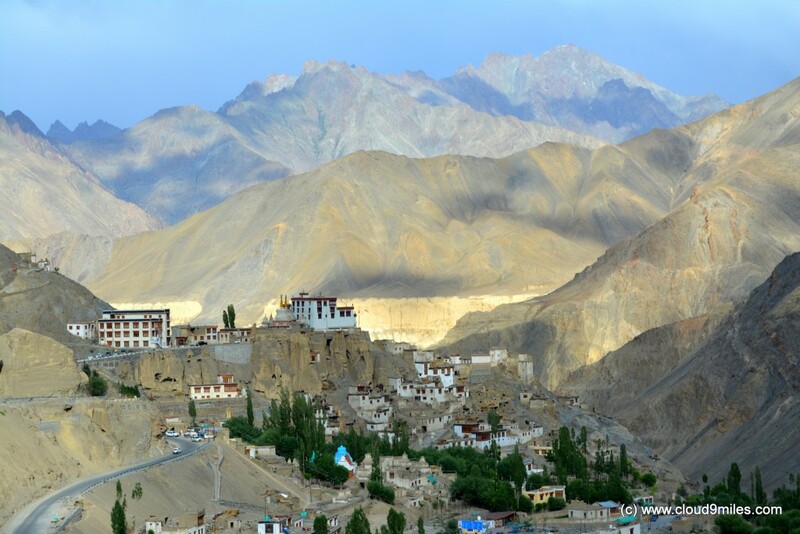 Ladakh is not beautiful because of any particular spot or attraction but it is universally mystical. 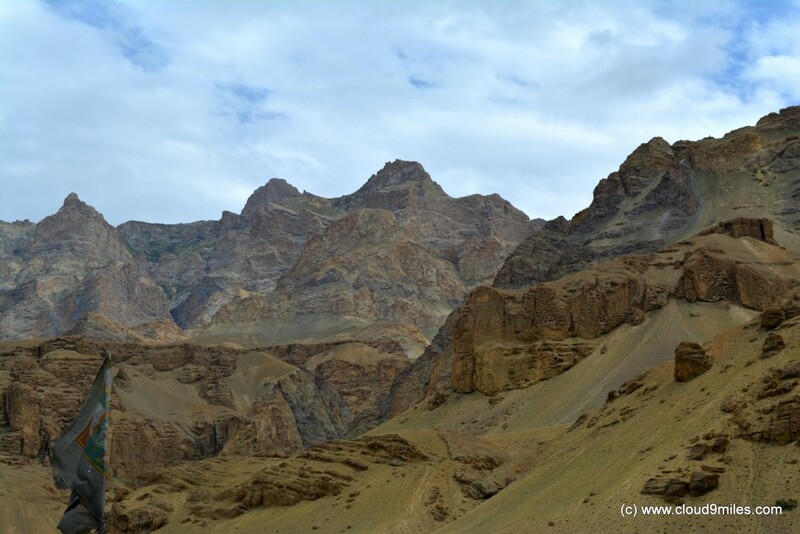 The journey through these terrains in itself is sightseeing. Wherever you step out becomes a spot for sightseeing. 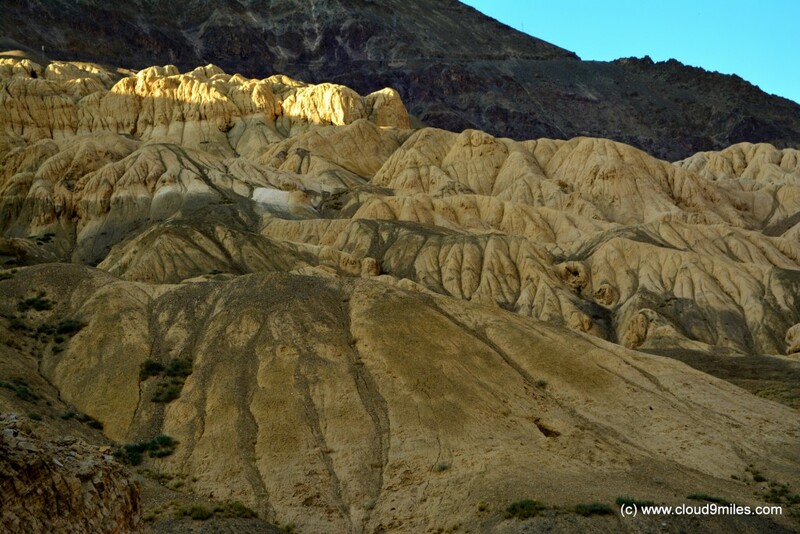 Every mountain and landscape was speaking to us and telling us some untold mystery. 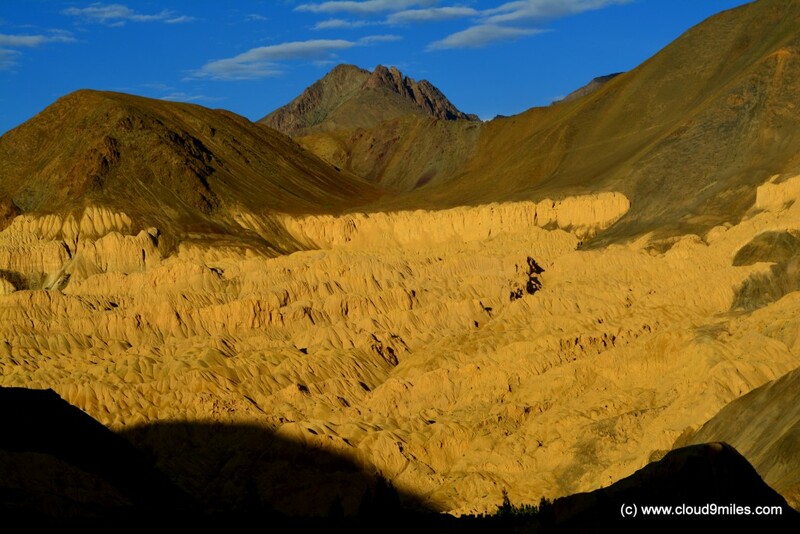 We cannot explain our feelings through words as it can only be felt by actually passing through these terrains. 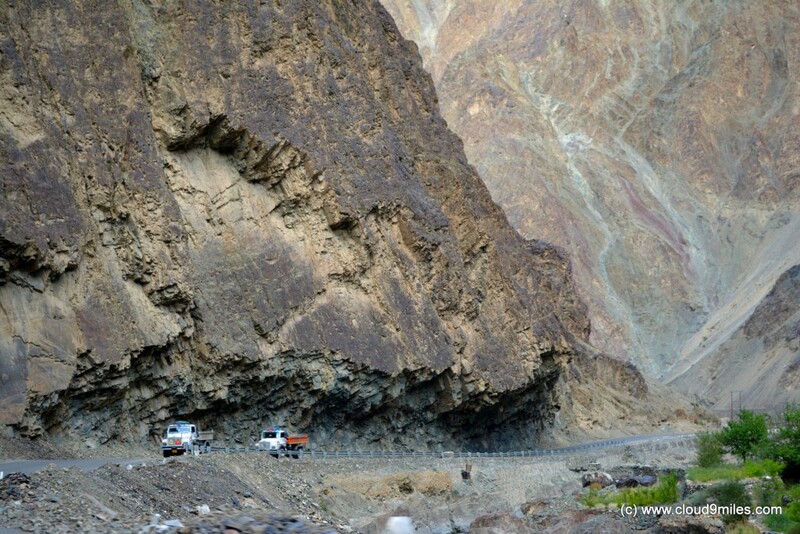 We are sure every traveller would have gone through such feeling while travelling through Ladakh. 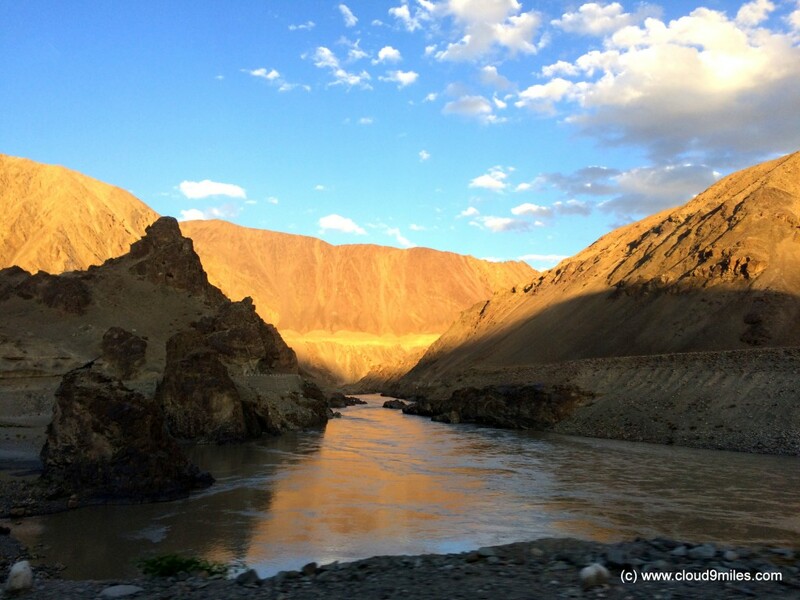 Mesmerizing landscapes, beautiful sky, glittering stars, rivers, and surprises everywhere – Julley to Ladakh.